Hi All!! So, are you ready for Thanksgiving? I can't wait until tomorrow. It's so nice to get together with family and friends and enjoy some delicious food. But, before I go I wanted to leave you with a sweet SASI Christmas project. I was baking some cookies the other night and decided that I wanted to make a cute container for them. I think freshly baked cookies make the best holiday giftS. So, to dress them up, I whipped up a paper box with a divider in the middle. I thought the divider made the cookies look professionally baked *wink*. The patterned paper used is from the new Christmas Key Ingredients. I love that paper!! Everything is tied with some wide chocolate ribbon. The tag was created with two different SASI sets. 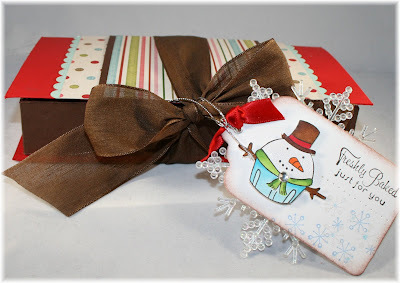 The snowman comes from "Home Sweet Home" set and the sentiment is from the "Tag Treats" set. I colored everything in with my Copics and added some Shimmerz paint on the snowman. The large snowflake ornament is from the Dollar Tree. Anywho, I hope you enjoyed my little cookie project. Make sure to check back for some more amazing creations from the Baker's Dozen. Oh wow, Ana, this is BEAUTIFUL!! Ana, this is just adorable! Who wouldn't LOVE to receive this? How cute! You are so clever to come up with all these ideas! 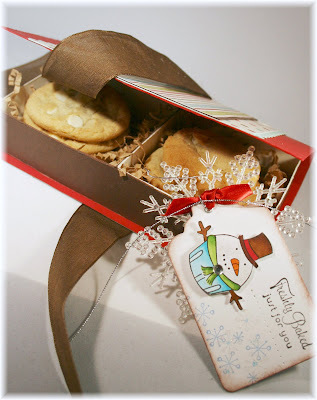 I love this - the box is such a wonderful way to give cookies - so cute and super thoughtful! I love to bake cookies and give them as gifts - but this is such a cute way to package them. Is there a template for the box and divider? Great box and tag Ana! Love the colors and the snowfake! TFS!